Saman Explorer is a deluxe standard dive liveaboard runs by Extra Divers Fleet. It mainly offers diving liveaboard trips in Hallaniyat Islands of Oman during Oct to mid May every year, it can accomodate 22 guests onboard. Saman Explorer has been operated in Egypt for a few years, it is now relocated to Oman for new adventures. 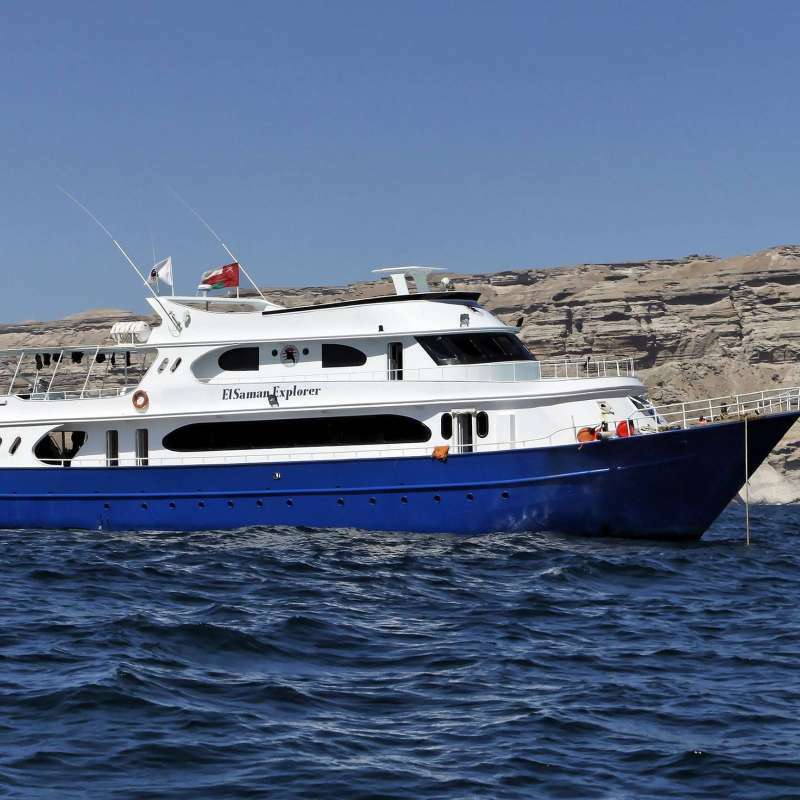 This vessel is operated by the international team of "Extra Divers Fleet", it offer dive liveaboard trips around Oman, the regular trip is around Salalah region where the famous Halaniyat Islands is located. Saman Explorer is a steel ship measuring 34 meters long and 9 meters wide with all international safety equipment such as Radar, GPS, compass, radio, depth gauge, First Aid kits, Oxygen, life jackets, satellite phone etc. Onboard, there is a spacious air-conditioned lounge with dining and entertainment facilities on the main deck. Guests will be served with meals three times a day in buffet style, which contiains Omanis food and international cuisines. For underwater video and photography enthusiasts, there are plenty of recharging points/edit playback facilities. Outside of the indoor lounge, there is a large dive deck located on the back of the main deck, it is spacious and well equipped with individual personal gear storages and an in-place fill station, large rinse tanks and deck level fresh water shower and toilet. There is a spacious sun deck and a large comfortable fly deck with both a shaded and sun area, as well as a separate area for relaxing in front of the wheel house. Saman Explorer has a team with international crew of 8 to 9 members consists of experienced staff, English and German speaking dive guides who are ready to welcome you onboard. The last night of the liveaboard trip is usually spend on a 5 star luxury hotel (such as Marriott), halfboard in the hotel is also included by Saman Explorer. Please note that there is no alcohol provided on board. There are possibilities to purchase the allowed quantity on arrival at Muscats airport. However, at Salalahs airport there is no possibility to buy alcohol yet. Saman Explorer has 11 comfortable morden guest cabins, can accomodate up to 22 guests. All cabins are equipped with a silent air-conditioning system, reading lamps, charging stations and an en-suite bathroom. Located on the main deck, the largest cabin onboard with 20sqm in size. Equipped with a large double bed, window with a great view of the sea as well as desk and mini bar. Located on the upper deck, each cabin equipped with two single beds, seaview windows. Located on the lower deck, each cabin equipped with two single beds, large portholes. 3 or 4 dives per day, night dive included. Le Oman Aggressor est un magnifique yacht en acier offrant des croisières de plongée dans le Golfe d'Oman. Il peut accueillir jusqu'à 22 passagers à son bord avec luxe. Il propose des séjours de 7 nuits dans les îles Daymaniyat, dans la péninsule de Musandam et dans les îles Hallaniyat, ainsi que des séjours de 10 nuits dans les îles Daymaniyat.